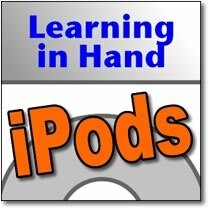 Learning in Hand: iPods Episode #10: Photos Part 2 is available and focuses on various kinds of educational image sets. First, learn about commercial sources of image sets, like iPREPpress and Raybook. Explore many different kinds of image sets, including visual books, study aids, flash cards, matching games, math manipulatives, converters, response cards, and more. In fact, you can visit learninginhand's Gallery of Educational Image Sets and download lots of great learning tools and resources for the Photos section of an iPod. Although teachers and students can download pre made image sets, the real value is using software like PowerPoint or Keynote to make your own image sets. Creating your own study aids really aids your study of a topic! Listen to all 18 minutes of Episode #10 for great tips for using and making educational image sets. Refer to Photos Part 1 for basic information about Photos on iPods.